With the growth of broadband internet usage and search engines migrating to universal search results, video on the web has become more prominent than ever. There are now hundreds of video sharing sites that allow anyone to upload their videos online and share them with your friends, colleagues and family. So wouldn’t it be nice to have a video platform that would allow you to upload your videos to multiple networks at the same time? Well TubeMogul has solved that problem. Founded in 2006, provides a user-friendly platform for distributing your video content across multiple video sharing sites. TubeMogul caters to small and large, video publishers and users who need to distribute their video content easily and effectively, across multiple networks. 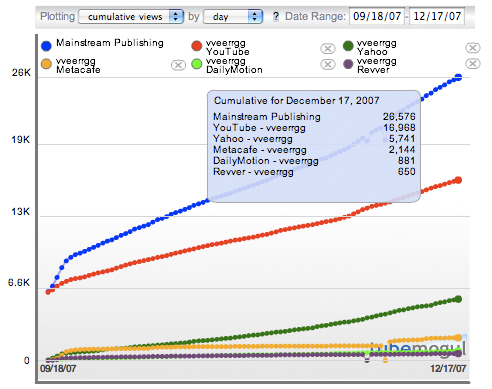 Not only can you upload your videos simultaneously across these networks, you can obtain analytics data as well. You can easily create easy to read charts, tracking your videos or video publishers. By leveraging their analytic technology, publishers have the power to understand how, when, and where users are watching their videos, as well as track and understand how effective their marketing campaigns are. Currently TubeMogul has relationships with YouTube, MetaCafe, Viddler, Google Video, AOL Video, Stupid Videos, MySpace Video, DailyMotion, Blip, Crackle, Veoh, Sclipo, Howcast, 5min, and are constantly adding new sites each month. 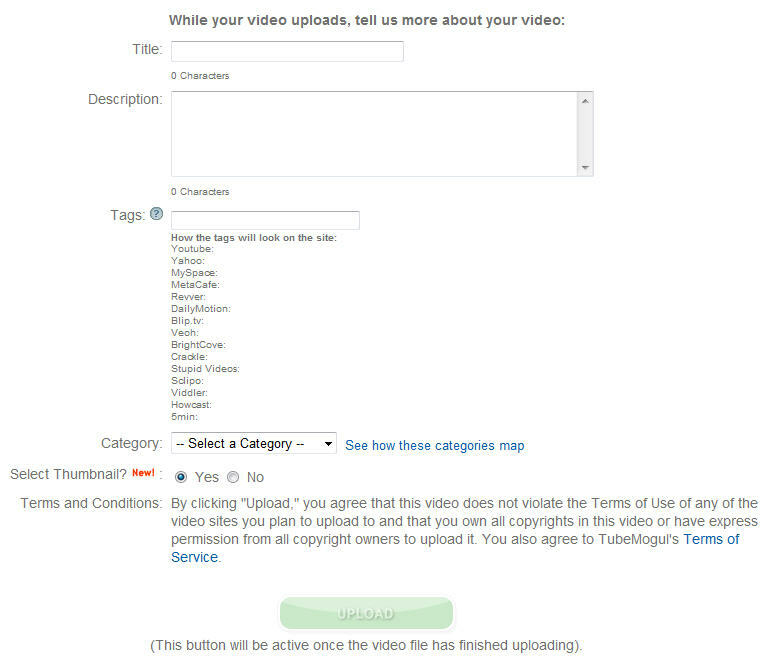 TubeMogul allows you to optimize your videos by adding targeted Title, Description, and Keyword data. Appropriately choose which category your video should be filed under. Chart your video analytics data for easy analysis. See which video sharing sites are more effective, create custom charts to show your boss or your marketing department, and make educated marketing decisions based on their video analytics data. 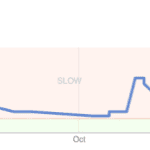 Probably the best part about TubeMogul is the price…it’s free! They are currently giving their “Personal” level (150 video deployments a month), free of charge. They do however offer higher end packages geared towards agencies and production groups. Each level is based on the number of “video deployments” you will be distributing a month. A video deployment is defined as uploading a video and distributing it to one of their affilate sharing sites.. For example, if you uploaded a video and distributed it across 10 sharing sites, that would be 10 deployments. To learn more, see their detailed Video Distribution Package Chart.